The prostate gland primarily functions in the production and storage of seminal fluids and is located just below the bladder. In healthy individuals, the gland is approximately the size of a walnut and encircles the urethra without unduly placing pressure on the duct. If a tumor develops in the prostate, however, the urethra becomes increasingly compressed as the growth enlarges, which can result in decreased urine flow, a need to urinate frequently, and other urinary problems. Symptoms of an abnormal growth may also include sexual dysfunction and frequent pain or stiffness in the upper thighs, hips, and lower back. 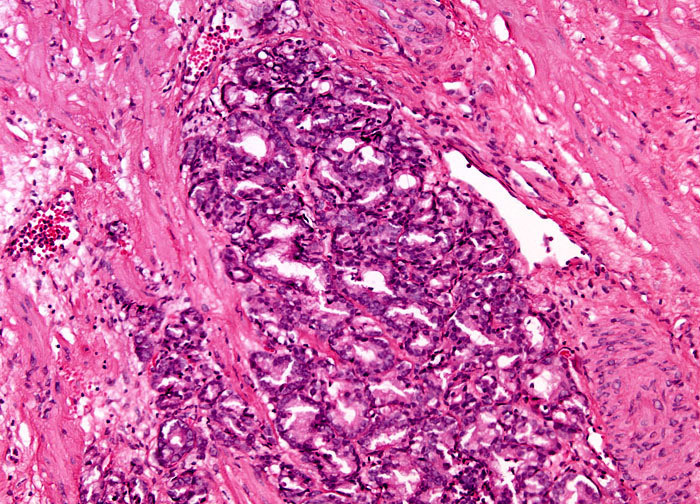 Prostate tumors can develop from various types of cells, but the vast majority (approximately 95 percent) of growths are identified as adenocarcinomas, the malignancies originating in epithelial glandular tissue. In as few as 5 percent of prostate cancer cases, the tumor is of another variety, such as small cell carcinoma, basal cell carcinoma, or endometrioid cancer.